Well known for his dark humour he is a favorite amongst many comedy lovers, and hated by others for being offensive! Nothing is off limits for this comedian, covering all sections of society. 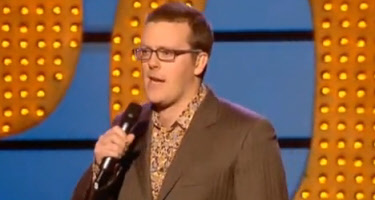 Take him as he is Frankie Boyle will never change his style of routine or nature of gag. Lots of people (in YouTube comments) don’t seem to get some of the jokes. The first joke about Batman is because the ‘Joker’ was played by the actor Heath Ledger who died in 2008, hence the joke that he won’t be back. The Diana minefield gag is because Diana was well famed for her charity work in third world countries, but also the rumours she cheated on Prince Charles a few times, hence the gangbang part. You can no longer see Frankie on new episodes of Mock The Week. But on a variety of Sky & Virgin TV channels you can see repeats of him in that and other shows he has appeared in such as; Never Mind The Buzzcocks, 8 Out of 10 Cats and Have I Got News For You. funniest comedian to come out of Scotland since the big yin. how can m’cintyre and howard even be in the same room as Frankie?? ?